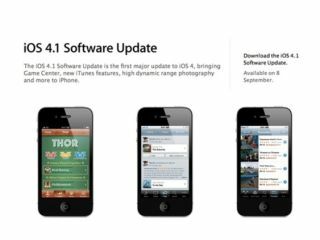 Apple has finally made the iOS 4.1 update available to (select) iPhone owners, bringing a couple of enhanced features. Game Center is the most exciting new addition, bringing the chance to compete against others across the world – or 'experience social gaming', as Apple puts it. iTunes Ping – another social feature from the Apple-ites – is available too, allowing you to share the things you love with unsuspecting buddies who may or may not care. On the hardware side, the camera's getting some more love already, with HDR photography being added with the iOS 4.1 update. This means the phone takes multiple shots at once, helping you get the right 'light intensity' in photos. The video zone has also been tinkered with, insofar as you can now upload HD video to MobileMe and YouTube directly from your iPhone 4. Click and plug and accept and wait over on iTunes with your iPhone, and you'll be the proud owner of a +0.1 newer iPhone. Unless you downloaded iOS 4.02, in which case it will only be 0.08 better. Sorry.